PORTIONS OF THIS ARTICLE ORIGINALLY APPEARED IN THE 2013 ACSA CONFERENCE PROCEEDINGS “NEW CONSTELLATIONS/NEW ECOLOGIES”. above image courtesy of the Starn Brothers. 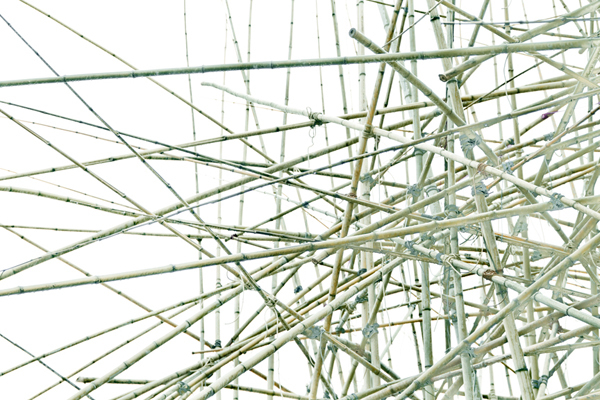 In a previous posting, “Synanthropic Habitats” I made the assertion that a large amount of the work on Animal Architecture and within the field of bio-inclusive architecture can be grouped into roughly three categories; Synanthropic Habitats, Soft Structures and Post-Animal Projects. Synanthropic habitats, as was discussed earlier, are the most numerous projects on the website and demonstrate a desire or assumption of cross-species synthesis. They strive to bring nonhuman animals and humans together in closer relationship and often closer proximity. But, this is just one attitude. Soft Structures on the other hand reflect a different, and just as valid philosophy with regard to the human/animal question. Rather than to presume a sense of synthesis, a utopian state where all biological beings coexist in peace and harmony, Soft Structure projects assume a local separation of species. The underlying assumption to these projects is that rather than design specifically for alternate animal life as we saw in the Synanthropic projects, the best strategy is to minimize detrimental human habitation. These projects also tend to operate on the scale of landscape architecture, Megastructure, large urban agriculture, or infrastructural projects, often proposing to intervene, design or reorganize square miles of land. 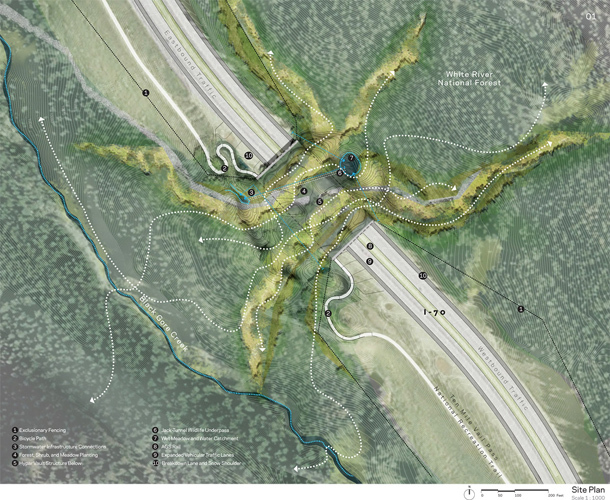 Field Operation’s Downsview Park Proposal, the work of the Starn Brother’s and Micheal Van Valkenberg’s ARC Wildlife Crossing each demonstrate the design strategies present in Soft Structure animal projects. The often unstated aim of a Soft Structure project is to lessen human development and to strategically play into the ecosystem at large. 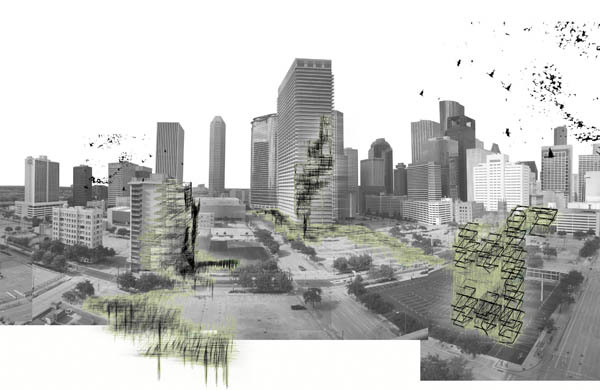 Projects tend to dis-aggregate human habitation, favor less dense urban cores, a higher percentage of green-space and porous, if not altogether temporary architectural structures. Many of the projects propose extremely large interventions, akin to the mega-structuralist movement of the 1950’s and 1960’s in the US and UK lead by Yona Friedman. The extreme size of these projects however present a challenge for the architect and makes designing for the specific animal habitation difficult if nearly impossible. The implied argument here seems to be why worry about the bird’s nest when you can provide the forrest. But what these projects lack in the definitive design qualities of the Synanthropic group, they make up for in their largeness of scale and a certain amount of ecological believability – if, not necessarily in terms of real-world feasibility (in the case of the megastructure). The extreme scale of the projects are sometimes barriers for their implementation and seemingly, in a world of growing populations, urban densification, and economic pressure their “largeness” does seem to pose a real problem to their eventual effectiveness. But where the success of the Synanthropic projects relies on a collaborative relationship between human and animal partners, many of the Soft Structure projects seem to wish-away the humans. Over-all, in projects like Downsview, there is a quiet refusal to adequately address the demands of human habitation and a sneaking suspicion that if you pushed them, the designers would really prefer for the humans to be gone completely. Yet one of the more exciting possibilities for soft structures is their ability to accommodate physically, philosophically, and aesthetically a multitude of design projects. Yona Friedman’s socialist attitude of freedom and democracy is reflected in the megastructural universalising structural grid system. Yona would have us believe that within the megastructure, anything is possible. And more importantly that the form of the megastructure reflects a philosophical universalizing of life. Its aspirations are akin to an architectural Esperanza — a unifying architectural framework that transcends form and function, and possibly even die-hard dualisms of nature/culture and human/animal. Megastructure sketches by Yona Friedman. What I’m suggesting is the potential for Soft System projects to organize the distribution and planning of Synanthropic Habitats. This strategy would approach the human/animal and living/non-living divide from two scales – at the urban/landscape scale of the megastructure project as well as the local, living-space scale of the synanthropic habitat. More to the point, it’s my opinion that both systems, in order to be fully effective, in fact require each other. The ecological benefits and attributes that are the object of synanthropic habitats operate at scales larger than the individual projects. They are the “ground-up” approach, which if they were to be successful would need the “top-down-ness” of the megastructure. Scaffolding City, a project proposed and published in “Bracket – Goes Soft” suggests some of these combined local/global relationships, but on the whole this territory is largely unexplored. Scaffolding City, published in Bracket-Goes Soft. But the potential benefits are enormous. More than simply benefiting from an increasing number of companion species, is the opportunity to “cross the great divides”. In such projects lies the potential to “flatten into mundane differences” the animal/human, nature/culture and organic/technical divides that have served to under-pin the majority of western culture – including the history of architecture. While it’s difficult at this time to claim that Bat Cloud has flattened the human/animal divide, it is fair to claim that with time, such projects hold the potential to radically redefine architecture and design. 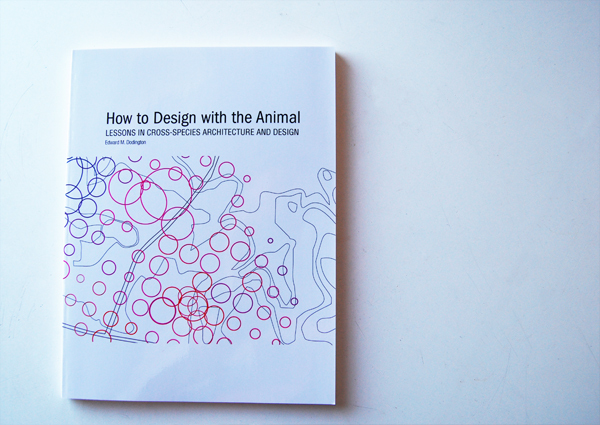 Moreover such projects are certainly, at this moment, changing popular opinion about animal agency in design practices. A discussion of the post-animal projects will follow.